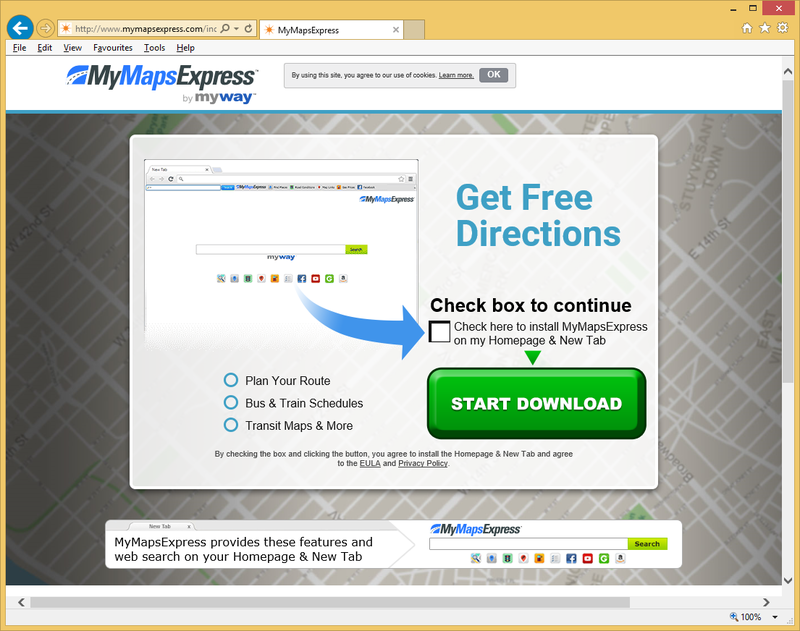 MyMapsExpress Toolbar is a browser hijacker that is advertised as an add-on that would help you access various maps. Browser hijackers are not malicious computer viruses so it appearing on your browser should not cause panic. However, it is not recommended to allow it to stay on your computer. It will change your browser’s settings and possibly try to redirect you to sponsored pages. Browser hijackers exist to generate traffic for those sites so that is why you are redirected to them. There are two ways you could have gotten the hijacker, you either downloaded it yourself or it entered your computer together with free software. In the case of the latter, you need to learn how to install programs without the added items. It should also be noted that even though browser hijackers are not dangerous themselves, they may be able to lead you to malicious content. This is one of the main reasons why you should delete MyMapsExpress Toolbar. Browser hijackers usually use the same method to fool users into installing them and that is using free software. They are attached to freeware in a way that allows them to install alongside without you even noticing. If you want to prevent these unwanted installations, use Advanced or Custom settings and deselect the boxes that become visible there. Seeing as all you have to do is uncheck a couple of boxes, there is no extra time needed. Using Default settings is not recommended because you will end up with all kinds of unwanted items. And it would be much quicker to initially deselect everything that has been added to the freeware than it would be to remove MyMapsExpress Toolbar or similar later on. You could have also allowed the hijacker to enter your computer yourself, by obtaining it from the official website. The hijacker will take over your Internet Explorer, Google Chrome and Mozilla Firefox browsers and set hp.myway.com as your homepage, new tabs and search engine. We doubt you remember allowing these changes because browser hijackers can do it without your explicit authorization. You may try to change the settings but will quickly notice that they are immediately modified again by the hijacker. This will go on until you delete MyMapsExpress Toolbar. We do not recommend using the search engine that you will encounter on your new homepage because it may insert sponsored content into the results. When you are led to those sponsored pages, the owners make money and that is why hijackers redirect you to them. The worrying thing about those redirects is that you could be led to dangerous sites where malware could be lurking. Uninstall MyMapsExpress Toolbar to make sure you avoid a possible malware infection. Using anti-malware software to remove MyMapsExpress Toolbar would be the quickest option because you would not need to do anything besides employing the program. Manual MyMapsExpress Toolbar removal may take more time than you would expect because you would need to find the hijacker yourself. After you erase MyMapsExpress Toolbar, go and change your browser’s settings.